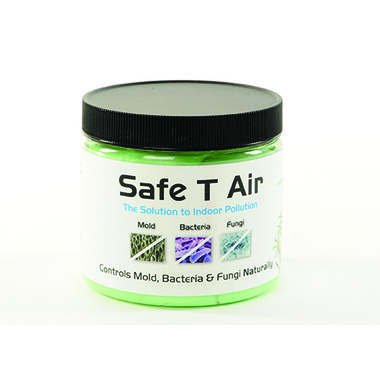 Safe T Air prevents mold from starting to grow and reduces existing mold up to 98% using tea tree oil as the powerful, non toxic and all natural anti-bacterial, anti fungal and anti septic active ingredient. Simply place the self contained packaging near affected area and it will start working immediately using the existing air movement indoors to counter mold, bacterial and fungus growth. This is an excellent product. I use it to keep the musty smell out of my basement, and it really does a good job to change the air. (It is not an air freshener per se. It removes the cause of problem air, so it works better.) I have bought it twice now, and will again. I have bought this product twice now, because my basement is stuffy and musty. Safe T Air is a natural product which removes the problem and doesn't mask it. It seems to really do the job. I like that it's safe and controls mold, bacteria and fungi. It provides a somewhat minty smell which you don't notice in a big room, but I wouldn't put it too close to where you're sitting, but I'm not a fan of scents myself.